La Gioconda was painted by a pupil or follower of the artist at the same time as the original. 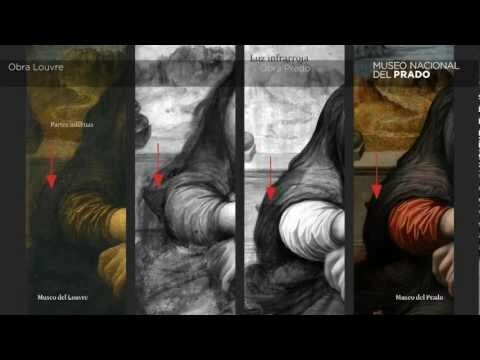 The importance of this discovery, which was made during the study and restoration of the painting at the Prado for its inclusion in the exhibition at the Louvre on Leonardo that opens on 29 March, lies in the fact that as a contemporary and perfectly preserved copy, it contributes important information on both the landscape background and on numerous details of the mysterious sitter. The latter include the shape of the chair, the ornamentation of the cloth covering her breast and the semi-transparent veil around her shoulders. Following its rediscovery, this copy of La Gioconda in the Museo del Prado, which has now been confirmed as a work of one of Leonardo’s pupils or followers working in his studio while the original was being painted, has not only been confirmed as the oldest known copy of this enigmatic image but also acquires considerable importance for its potential to cast more light on the Louvre’s painting. Having previously been in the Spanish royal collections, the present copy entered the Prado when the museum was founded in 1819. Although the exact date and manner in which it entered the royal collections is unknown, it is probably the work that is referred to in 1666 in the inventory of the Alcázar as a female portrait associated with Leonardo.